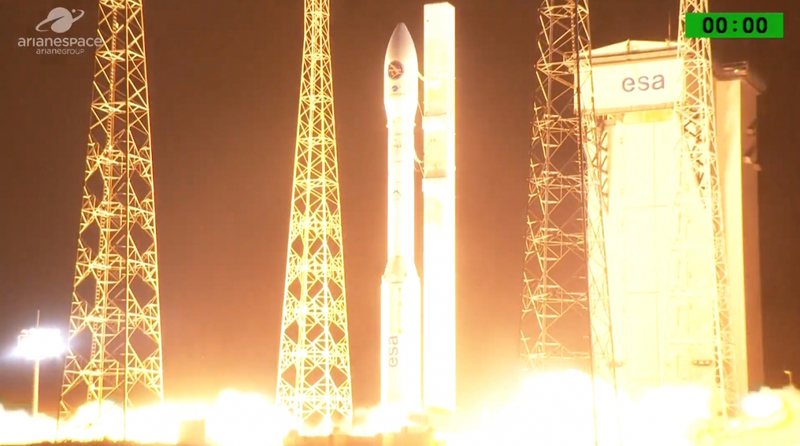 Italy’s PRISMA Earth observation satellite launched aboard Arianespace’s Vega rocket Thursday. Vega lifted off from its launch pad at the Centre Spatial Guyanais in Kourou, French Guiana, at 22:50:35 local time (01:50 UTC on Friday). PRISMA, or Precursore Iperspettrale della Missione Applicativa, is a small hyperspectral imaging satellite that has been constructed by OHB Italia and will be operated by the Italian Space Agency, Agenzia Spaziale Italiana (ASI). 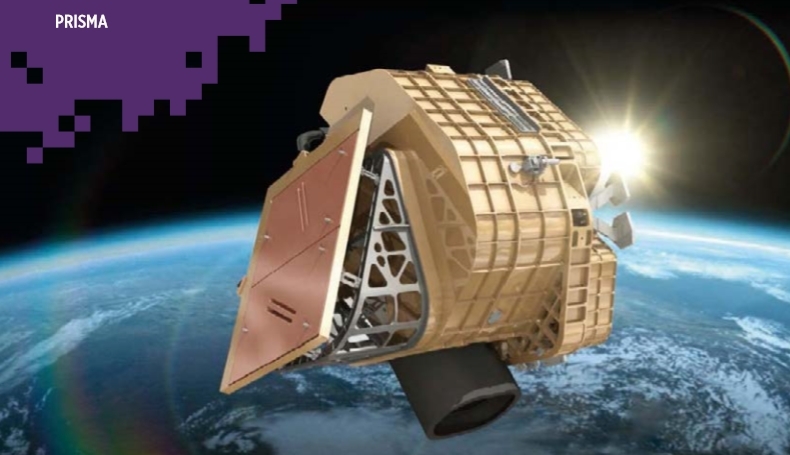 The satellite, whose name translates into English as “hyperspectral precursor of the application mission”, is intended to demonstrate the small satellite platform and its imaging payload, while also performing imaging that is useful in its own right. The PRISMA mission grew out of the Hyperspectral Satellite for Earth Observation (HypSEO) project which was canceled in the early 2000s. While the satellite is intended to serve as a prototype for future missions, it has been designed with the needs of Italy’s scientific community in mind. PRISMA’s images will help scientists to study the environment and aid with the monitoring of land use, natural resources, water pollution, soil mixtures and the carbon cycle. PRISMA’s eponymous sensor compliment was developed by Leonardo SpA, and incorporates a hyperspectral imager which operates across 237 visible-light, near-infrared and short wave infrared bands with a spectral resolution of 12 nanometres. This can image a 30 kilometer (18.6-mile, 16.2-nautical-mile) swath of the Earth’s surface at a resolution of 30 meters (98 feet). A panchromatic imager provides complimentary observations, offering a five-meter (16-foot) resolution over the same swath. Both imagers will observe the Earth via a three-mirror anastigmat telescope with a 21-centimeter (8.3-inch) aperture. The imaging payload aboard PRISMA accounts for about 90 kilograms (200 lb) of the satellite’s 879-kilogram (1,938 lb) mass at launch. PRISMA is solar-powered through panels fixed to the spacecraft and is expected to operate for at least five years. The bespoke satellite bus is three-axis stabilized and incorporates hydrazine thrusters for on-orbit maneuvering. PRISMA will operate in a circular sun-synchronous orbit, 615 kilometers (382 miles, 332 nautical miles) above the Earth’s surface and inclined at 97.8 degrees to the planet’s equator. OHB Italia contracted Arianespace to launch PRISMA, using their small Vega rocket whose prime contractor is Italian aerospace firm Avio. The satellite arrived in Cayenne, French Guiana, on 11 January and was taken by road to Arianespace’s launch site, the Centre Spatial Guyanais (CSG) at the nearby town of Kourou. Following an initial checkout, the satellite was moved the payload preparation complex on 29 January. The satellite underwent a fit check with Vega’s payload adaptor, and a series of tests on its electrical systems. PRISMA was fuelled on 13 February and integrated with the payload adaptor on 19 February. Seven days later the satellite was encapsulated within Vega’s payload fairing. While payload preparations were underway, Arianespace began to assemble the Vega rocket on its launch pad, Zone de Lancement Vega (ZLV). Vega is stacked vertically, in place on the pad, using a mobile service tower that is then moved away from the rocket. ZLV has been used for all of Vega’s launches – although it was previously Ensemble de Lancement Ariane 1 (ELA-1), serving the Ariane 1, 2 and 3 rockets from 1979 to 1989. The pad also saw a single launch of a Europa II rocket in November 1971, which failed to achieve orbit. Vega is a four-stage rocket which primarily uses solid rocket motors – with a small liquid-fuelled fourth stage for precise orbital insertion – to deliver satellites to low Earth orbit. 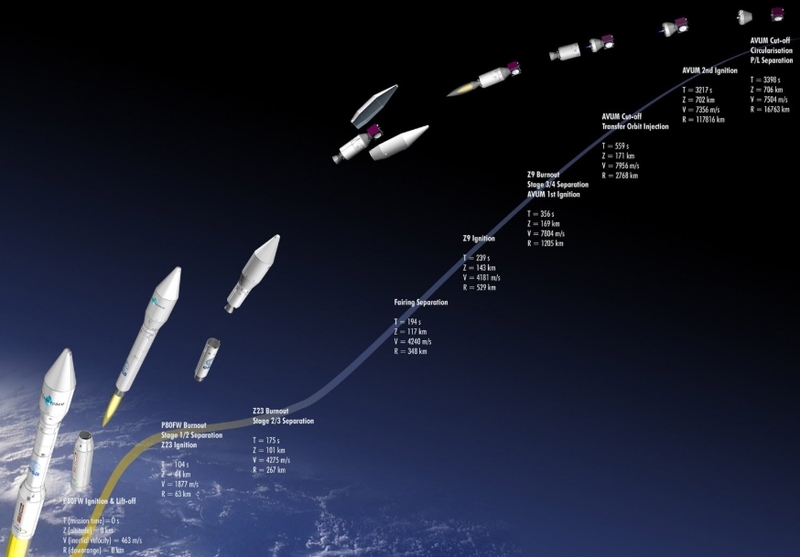 Vega first flew in February 2012 and has made thirteen launches to date, all of which have been completed successfully. 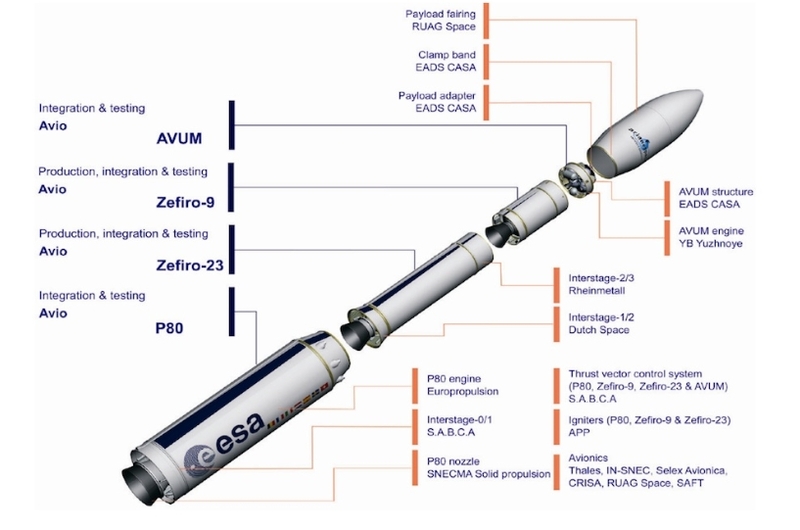 The rocket consists of a P80 first stage, Zefiro 23 second stage, Zefiro 9 third stage and the liquid-fuelled AVUM propulsion module as the fourth stage. For Thursday’s launch assembly of the Vega – designated VV14 – began on 11 January when the rocket’s first stage was transferred to the launch complex. The interstage between the first and second stages was fitted on 30 January, followed by the second and third stages – already integrated with each other – atop the stack on 1 February. Between 7 and 8 February the fourth stage, AVUM, was installed. Vega’s upper composite, consisting of the payload adaptor, fairing and the encapsulated PRISMA satellite, was transported to the launch pad on 28 February and attached at the top of the rocket on the following day. Following this, final preparations and integrated testing of the rocket and payload began. Storable propellants were loaded into the AVUM fourth stage and the rocket’s attitude control system, a rehearsal of the countdown was conducted, and the rocket’s components were armed for launch. PRISMA had been scheduled to lift off on 14 February, however the launch was delayed by a week to allow for additional checks to be performed at the launch pad. Thursday’s final countdown began nine hours and 10 minutes before Vega was due to lift off. The first hours of the countdown saw the vehicle systems brought on line, including the multi-functional unit (MFU) that controls the rocket’s electronics, the inertial reference system, telemetry systems, the safeguard master unit (SMU) and Vega’s onboard computers. The launch pad’s service tower began to move away from the rocket about three and a quarter hours before liftoff, taking about 45 minutes to reach its parked position. The final four minutes of Vega’s countdown involved the Synchronised Sequence, when the rocket’s computers took control of operations and conduct their final preflight checks. Once the countdown reached zero, Vega’s P80 first stage motor ignited and VV14 climbed away from French Guiana. It took about half a minute for Vega to reach Mach 1, the speed of sound, while the rocket passed through maximum dynamic pressure (Max-Q) a little over twenty seconds later. The P80 burned for one minute and 54 seconds before exhausting its propellant. The stage was jettisoned when it burned out, with the second stage Zefiro 23 igniting one second after separation. The second stage burn lasted one minute and 43 seconds and third stage ignition came thirteen seconds after the second stage burned out and separated. The Zefiro 9 third stage fired for two minutes and 35 seconds. About five seconds after the third stage ignited, Vega’s payload fairing separated, exposing PRISMA to space for the first time. The fairing, which protected the satellite as Vega climbed through the atmosphere, was no longer needed in the vacuum of space and so it was discarded to save weight. The fairing splits into two halves, which fall back to Earth. When the third stage burn concluded, the stage separated. Thursday’s launch then entered a short coast. The fourth stage – AVUM – ignited 100 seconds later for the first of three expected burns to complete Vega’s mission. The first burn lasted four minutes and thirty-eight seconds to put PRISMA into an initial low Earth orbit. AVUM features a restartable RD-843 engine, developed by the Ukrainian Yuzhnoye Design Bureau and Yuzhmash production plant from engines originally designed to power the third stage of the Soviet (later Russian) R-36 missile. Burning unsymmetrical dimethylhydrazine and dinitrogen tetroxide, the AVUM is used to ensure Vega’s payload is placed into a precise target orbit. Following its first burn, AVUM coasted for 38 minutes and 36 seconds before restarting for the next maneuver. This will was a seventy-two second burn to inject PRISMA into a sun-synchronous orbit. The satellite separated 96 seconds after this burn was completed – at 54 minutes and eight seconds mission elapsed time. AVUM’s final burn was scheduled for 49 minutes and 44 seconds later, as it fires for three and a half minutes to use up remaining propellant and remove itself from orbit. Thursday’s launch was the first of four Vega missions planned this year. The next launch is due in a month’s time with the Falcon Eye 1 satellite aboard, followed by another flight in August that will carry a cluster of small satellites. Some time after that launch, another Vega will deploy Falcon Eye 2. Before then, Arianespace’s next launch will be on 4 April, when a Soyuz rocket will carry four O3b communications satellites into orbit.